It is important to us that you get as much life out of your Hot Tub as possible and this means you should consider the use of good quality chemicals. They are essential in maintaining both the health and vitality of your water, as well as the components of the Hot Tub. A sanitizer is absolutely essential. It doesn’t matter how clean your Hot Tub is, bacteria can still form. Our range of sanitizing products – such as chlorine and bromine – will provide an excellence defence against bacteria. Don’t panic, this isn’t quite as drastic as it sounds. Shock Treatment is simply carried out to prevent the effects of organic waste compounds and involves periodically adding an increased amount of chlorine or bromine to your tub; either a weekly or fortnightly dose is recommended, depending on how often you use your Hot Tub. A Clarifier will help to keep your water crystal clear and can be used on a weekly basis. It works by fighting the particles that slip through the filter system. We understand that the above may seem like a daunting proposition, but it really isn’t. Your health is important to us and by following these simple procedures you will ensure that your Hot Tub remains clean and sanitized. If you have any concerns please don’t hesitate to contact us. If you would like any further advice regarding the best hot tub chemicals to use, or want any more information on our fantastic hot tub chemicals collection, be sure to get in touch with our friendly and dedicated team. Simply fill in the enquiry form or call us and we’ll do our best to help. 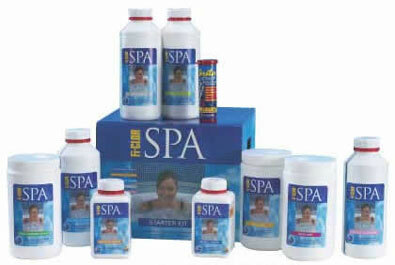 If you wish to see our full range of hot tub chemicals, please click here.